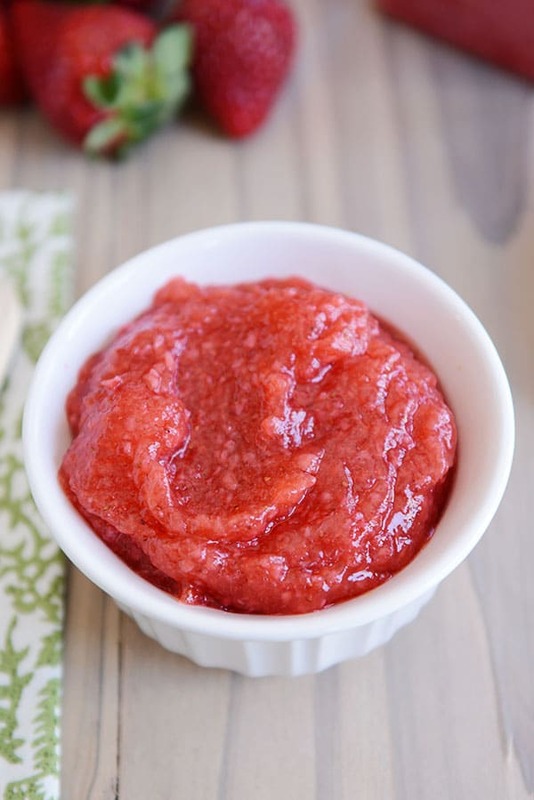 This is hands down the best recipe for no-cook strawberry freezer jam ever! Bonus: you can use a lot less sugar than conventional freezer jams…or even use honey! The taste is so fresh and delicious; it’s incredible! Disclaimer: this post contains Amazon affiliate links for products I’ve bought there; feel free to shop around for the best deal! Me and my old-fashioned heart, well, we love canning, even if it is a dying trend (at least among many of my friends that I talk to). And yes, even freezer jam, as simple as it is, falls along the canning spectrum somewhere! 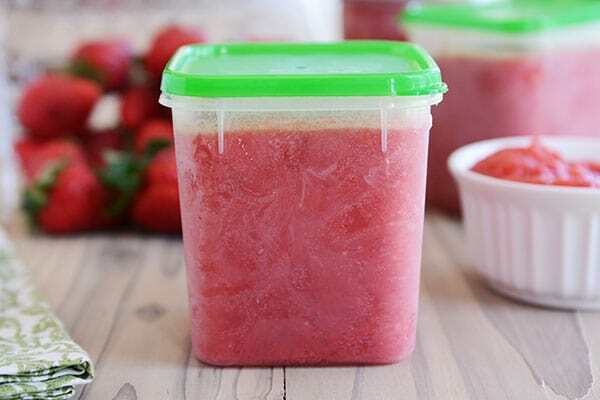 Making strawberry freezer jam is one of the easiest things to make and put by. Because it isn’t shelf stable, you’ll need freezer space for storage, but you can make small batches without any problem, so you ensure you have plenty of freezer space left for, you know, ice cream and other important things. Or, if you’re me, you just go ahead and invest in a large, standing freezer for the garage and a separate generator so that if the power goes out, your large batches of freezer jam won’t suffer. Now, I can’t promise your kids won’t ever leave the door of the freezer open a crack after snagging an otter pop, unintentionally letting every little bit of food in the freezer, including stores of precious strawberry freezer jam, thaw and drip and spoil over the course of a week. That is a personal issue you’ll have to navigate on your own. I used to do the whole cook-the-strawberries-for-half-a-day and then steam or water bath the jam so I could put the pretty jars on my shelves without need of refrigeration or freezing. 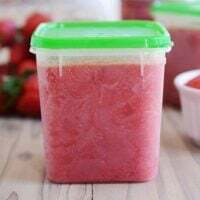 And while this type of cooked strawberry jam is tasty, with strawberries, there’s nothing quite like the fresh, bright taste of strawberry freezer jam. Because the strawberries aren’t cooked, every time you pull a container from the freezer and let it thaw, you get that luscious, just-picked berry taste. Now let me take a second to talk to you about pectin. If you’ve been around for a while, you know I’m not a fan of advocating specialty products or ingredients just for the sake of being trendy or different. 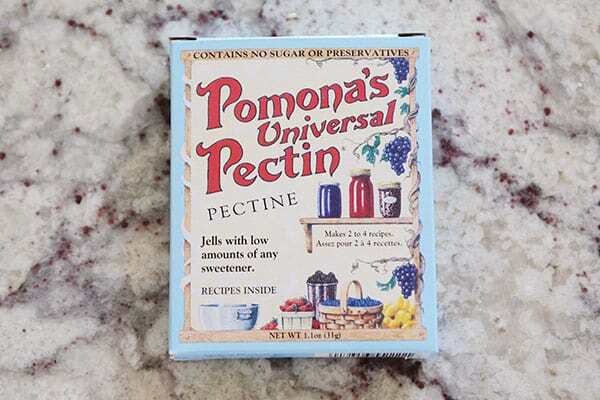 But in the case of freezer jam (or any jam or jelly for that matter), the only pectin I have used for the last several years, is Pomona’s Pectin (and yes, I have an updated jalapeño jelly post coming soon using this amazing stuff). I am totally unaffiliated with this company; they have no idea who I am, but I honestly, genuinely love this product so much that I’ll gladly tell the world about it. Basically, I got fed up with the extra junk added to most commercial pectins AND the fact that with most of them, you have to add as much, if not more, sugar as you do fruit (and most low-sugar pectins have a lot of added hidden sugars to compensate). I mean, don’t get me wrong, I don’t consider jam health food. But if given the chance to have the most delicious strawberry freezer jam on the planet AND have it be lower sugar or even made with honey, I’m gonna be all over that. Because, by doing so, the jam actually tastes like strawberries that are lightly sweetened with sugar. Instead of tasting like sugar lightly sweetened with strawberries. Pomona’s Pectin is all-natural; the citrus-based pectin is activated with a calcium powder mixed with water. There are no preservatives or added sugar to the pectin (additionally, it’s Kosher manufactured, vegan, gluten-free, and non-GMO, if you care about any of the above). And even though the method for using it is a little different than other widely available pectins on the market, it is NOT difficult. In fact, it’s super easy. I even made a little video to show you how simple it is. As far as availability, most healthier food stores (Whole Foods, Trader Joe’s, etc) carry Pomona’s. I even have a cute, family-owned grocery store close to me (Clif’s Market in Caldwell, if you are local to the Boise area) that carries it. But mostly, I stock up online. The reviews speak for themselves. This is good stuff. I buy from Amazon (this 6-pack is the most cost-effective) or sometimes sites like Thrive Market will have it for 50 cents cheaper or so. One box of Pomona’s Pectin can make about 6-8 pints of jelly/jam. If you’ve also used Pomona’s Pectin in the past, you’ll have to comment below and let me know what you think. If you haven’t, and you can get over me totally fangirling over pectin, of all things, you should definitely try it. 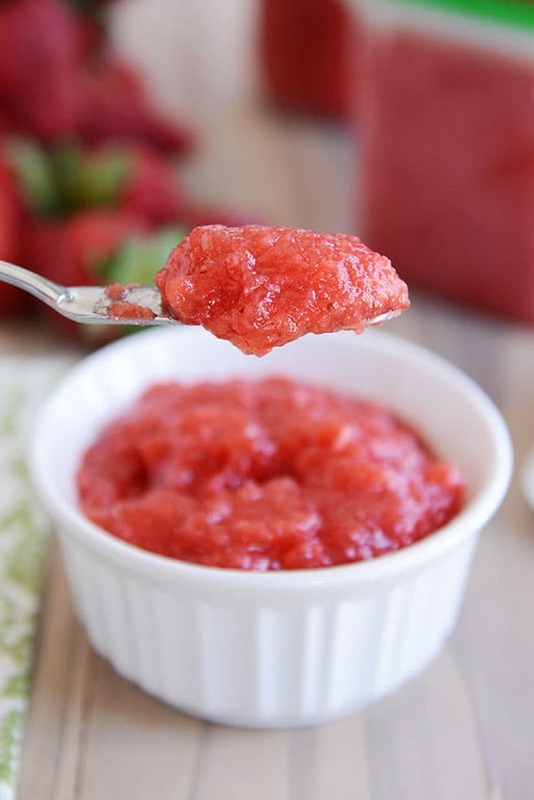 Without tooting my own freezer jam horn too much (let’s give the credit to Ms. Pomona, whoever she might be), I have had many, many people tell me over the years that this strawberry freezer jam is the best they’ve ever had. Honestly, I think it’s because that delicious, natural, strawberry flavor totally bowls you over with it’s fresh, yummy taste. 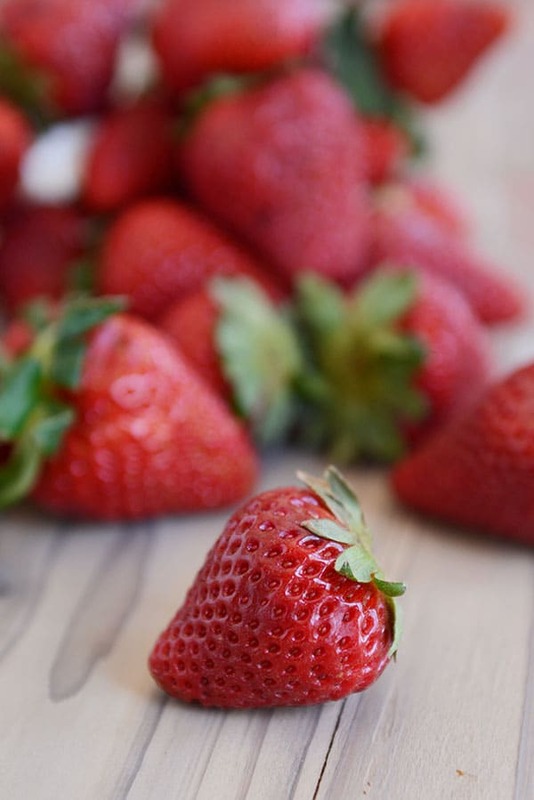 Just to give you a little comparison, for 4-5 cups of pureed strawberries, I use 1 1/2 cups of sugar (or sometimes half sugar and half honey) when using Pomona’s Pectin (and you can cut it down to as low as 3/4 cup per batch). Sure-jell, a popular pectin, has a recipe for freezer jam calling for 2 cups crushed strawberries and 4 cups sugar. And their low-sugar recipe uses 4 cups fruit to 3 cups sugar. So just from a sweetener perspective, Pomona’s is winning big time, and I promise that there is no sacrifice in the texture or taste of the jam because of it. In fact, quite the opposite: IT’S THE BEST FREEZER JAM EVER! Last week I snagged 32 pounds of strawberries and made pints and pints of jam in just under three hours. Not too shabby. What about containers, you ask? Well, I’m a rebel, and often freeze jam in jars. I know this is considered living dangerously on the edge in the jam world, since food expands in the freezer and jars can break, but as long as I’m careful to leave 1/2- to 3/4-inches of headspace in the jar, I’ve never had a jar crack. The jars can be topped with every day canning metal lids and rings or these handy dandy plastic lids (which for some reason make me very happy, I love these lids). I also use (and reuse year after year), plastic freezer containers like the ones pictured below. There are a lot of options out there; it’s not rocket science deciding which to choose. My freezer is stuffed with the ones you see below (picked those up at my local Winco) and also these Glad Freezeware containers. So there you have it! More words dedicated to the best strawberry freezer jam than I’ve written in my personal journal all year. Clearly, I love me some really good freezer jam, and there’s nothing that makes me happier than being able to share that goodness (or rather, the method to obtaining that goodness) with you! I have some other canning recipes (savory and sweet) up my sleeve over the next few months, but if you have any specific requests, leave them below in the comments! Take out the small white packet of calcium powder and measure 1/4 teaspoon into a jar or container with a lid. Pour in 1/4 cup water. Shake well; set aside. The rest of the dry calcium powder can be stored indefinitely for later use. This recipe has only been tested and made using Pomona's Pectin; other brands of pectin will not work the same in this recipe. I've never made the jam with all honey (although you can); but half sugar/half honey is delicious. And speaking of sweetener, you can cut the sugar down even more if you like, the minimum being 3/4 cup sugar or 1/2 cup honey. Following the recipe below, you'll have leftover pectin and calcium powder, simply fold down the tops of the packet or place in a small bag and store it in the Pomona's box to use later. It won't spoil. One box of Pomona's Pectin will make three batches of the recipe below (so about 8-9 pints of jam, depending on amount of sweetener used). ﻿I use my food processor to puree the strawberries and it makes adding/mixing in the pectin and calcium water simple, too. Sooo excited to make this!! Can I use the lemon juice that is bottled or do I need to go get a fresh lemon? Yes, you can use bottled lemon juice. Mel, you changed my canning life with this recipe! Now that I know about Pomona’s, I think I’ll ever use anything else. This freezer jam was delicious and so easy! It was great on sandwiches and AMAZING in ice cream. I branched out and made strawberry jam, peach pie filling, and peach jam with Pomona’s so far this year. It cans up beautifully! It’s the best! I’m glad your jam turned out amazing. Can I make it without the lemon juice? It seems “optional” from the instructions in the Pomona box and I just don’t have it in hand …. however I will go out and get it if you convince me! Haha! Just don’t want to spend a lot of time canning something sub-par but also want to save a trip to the store if it will be a negligible difference! Hope this makes sense! Hey Eliza, I definitely think the lemon juice helps with color and flavor! Hi! Quick question: I am confused about the “4t calcium water plus more if needed” in the instructions. So I estimate the packet has about 1 tsp of the calcium powder in it. If I were to use all that 1tsp of calcium powder, how much water do I desolve it in? And once I have done that, so I measure 4tsp of THAT mixture to make the 4 cups of strawberry jam? Thanks!! Yes, you use 4 teaspoons of the PREPARED calcium water in the recipe. The Pomona’s instructions have the exact amount of water, but I think it’s 1/2 cup water for every 1/2 teaspoon calcium powder. This sounds wonderful. I just placed my order for the pectin and while I was at it I ordered their canning book. How about frozen peach jam? I have a question about the yield. The post says one box makes 6-8 pints but the recipe says it makes 3 pints. Maybe I’m misreading something but I’m hoping it makes 6-8! So, I made this with strawberry/blueberry, lemon, and .5 cup honey .5 cup sugar, and the taste is wonderful, but the texture is strange to me – it’s a little gelatinous and not very smooth. I’m wondering if I messed it up or if I’m just used to MCP’s freezer jam, with it’s smoother, dare I say slimier, texture. My Pomona’s jam looks like yours in the video and pictures, so I don’t think I messed it up. Have you made freezer jam with MCP, and is Pomona’s supposed to be so different texture wise? I’ve never used MCP pectin so I’m not familiar with the texture of it, but because Pomona’s is a totally different makeup for pectin than other commercial pectins, I’m guessing the texture will be different of the Pomona’s jam. If you’d like it smoother, you can blend the berries more. I already had some liquid pectin so I thought I’d get some Pamona’s, make both, and do a taste test. My liquid pectin used 2 c. Strawberries and 4 c. Sugar. I made it yesterday and it set nice and thick and we all thought it was yummy and jammy. Today I made this one and wow! What a difference! It wasn’t as thick, but thick enough (I did add a bit more calcium water). But the flavor was SO MUCH BETTER! It was bright, fresh, and slightly sweet. A side by side comparison made yesterday’s jam taste sickly sweet- like hurt your throat sweet. All I could taste was sugar. Gross. I’ve tried low sugar pectins before with not great success. Thanks for this great recipe and recommendation! You should try using lime juice instead of lemon, and put lime zest in your jam. It is AMAZING! I love Pomonas. It is my go to pectin. I also find that it sets up much better than regular pectin. I was excited about trying this recipe as I’m not comfortable with the high amounts of sugar usually used. I followed the instructions carefully but my experience hasn’t been impressive… The jam develops a strange texture and smells fermented by the half way point of a pint jar. This morning I threw out a half full jar after noticing mold growing around the rim and on the lid. The pectin does not contain preservatives. And there is not enough sugar to act as a good preservative. I noticed in the instructions that came with the pectin it said the jam lasts one week in the fridge. When I read that I put my pint jars away and pulled out half pints. Hopefully to avoid the problem of it going bad before I use it as you experienced. So I made this recipe today, but with frozen strawberries. It kinda looks like the sugar may not have dissolved completely, probably because it was too cold…is there any way to salvage my jam? Help! I’ve made this recipe in the past, and looove it! I haven’t ever made it with frozen strawberries…so I’m not entirely sure. You could try cooking it to dissolve the sugar, but I’m not sure if it would stay thickened. Mine was also thin….could I add more pectin when I thaw a jar? You’d need to reboil the jam if adding more pectin to see changes in the thickness, I think. Hello, My name is Cari. And I’m an addict… Yes, I made this jam after the kids had gone to bed. I may or may not have been seen licking the vitamix. Made 6 cups. By the end of the next day, only one jar (2 cups) remained. End of day two, it was all gone. Now, my kids had their fair share, and ate it by the bowl. No kidding. By the bowl. But I’m pretty sure with my multiple pieces of toast that day, I inhaled as much as they did. Just found strawberries on sale again and made another batch. Hoping at least a little bit will make it to the freezer this time. Thanks again for another fantastic recipe. I made this recipe three times within two days and it has turned out runny each time. I followed the recipe exactly and used Pomona’s Pectin. Is it supposed to be really runny? Hey Michele, sorry to hear that. It might depend on the variety of strawberries/water content. It should start to gel as the pectin is stirred in…if it’s not, try upping the pectin. Hey Nicole – thanks for the comment! If it’s overly runny, you might need to add a bit more pectin and calcium powder (some of it may depend on the variety of strawberries used). Or try using slightly less strawberries to the current ratio of pectin. Let me know if you have other questions! Love this. Wish I had read it last week before making my first ever batch of freezer jam using the Sure jell! I really want to try this pomona pectin. 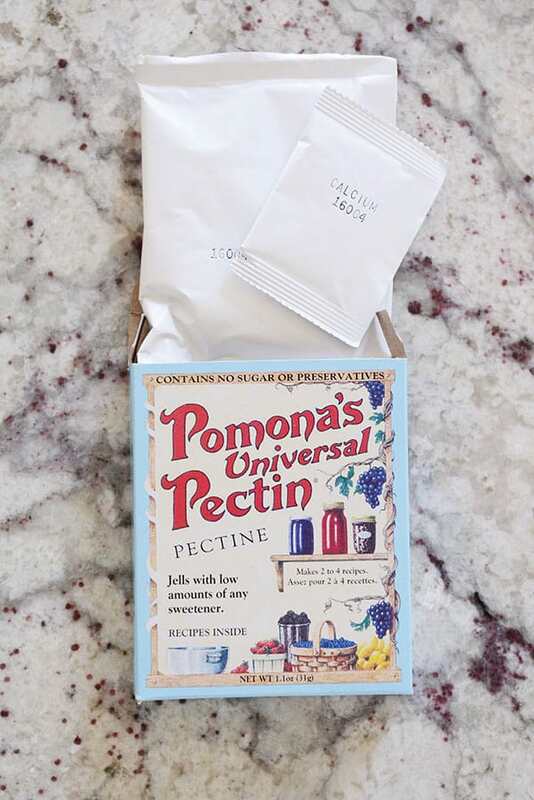 THANK YOU for introducing us to Pomona’s Pectin! I am loving making freezer jam with less sugar that actually tastes like the fruit it was made from. I have made 3 batches of strawberry jam, 2 batches of raspberry jam, and 1 batch of blueberry – All with terrific success! Thanks again! Yay! I’m so happy you love Pomona’s as much as I do! I have used Pomona pectin for years, but recently I started using instant clear jel in my freezer jam. Instant clear jel is a great natural product (I think maybe the Amish came up with it)…just mix it with your sugar to prevent clumps, stir into the fruit, give it about ten minutes & put your jam in jars & freeze. No cooking or boiling required. I also use it to thicken cobblers & pies. Also there is a regular clear jel that you use when cooking. Purchased from Hoosier Farms on Amazon. I’m not trying to be a smartie pie & I’m not affiliated with this product at all. I’m just an old home cook. These clear jels have changed the way I prepare food, from gravy to baked goods, even ice cream. Just want to share with you. Where did u buy this pectin that u used? And can i use it with sour cherries? I finally found local fresh strawberries! I made 1 batch of this recipe as written using the 3/4 cup of sugar as the berries were plenty sweet for me. All went well. It took me about 50 minutes and that includes sterilizing 3 jars, washing and topping the berries AND the cleanup. AND, the jam is delicious plus no heating up the kitchen. Thanks, Mel! Thanks for the report back, Liz! Glad you enjoyed the finished product! So what are the correct proportions of berry pureė to calcium powder/water…it is a bit confusing …. You’ll use 4 teaspoons of calcium powder/water mixture and the amount of strawberry puree listed in the recipe. Do I seal these and put them right in the freezer? Other recipes I have seen say to leave it out on the counter for 24 hours. Thank you! I pop them right in the freezer. Been canning both hot bath and freezer for 50 + yesrs. It activates the pectin for this particular brand of pectin (Pomona’s). I adore Strawberry Freezer Jam !! I am sorry if someone already asked but 106 comments it s lot to stroll through. How long will it keep in the fridge, once taKen out ot the freezer. Also I assume you puree your strawberries first ?? What calcium powder? Is t in the ingredients list? It’s in the box of Pomona’s pectin (which is listed in the ingredients). Maybe I am missing something here but I watched the video and read the recipe. In the recipe it says to measure out 4 teaspoons of calcium water and in the video you used 2 tablespoons. Am I missing something here? Which am I supposed to follow? Hi Whitney – in the video, I’m just loosely measuring the calcium water, so you can use the 4 teaspoons in the recipe and use more if the jam is taking longer to jell. Shoot, I wish I would have realized I’m not using all the calcium powder in just one batch (I actually made two batches and only used half of the water/calcium mixture you have in the recipe). I was happy that I could store left0ver powders to use next year (to make the price more worth it) but now I can’t because mixing 1/2 tsp only left less than 1/4 tsp and I’m wasting the remainder that I mixed up (I saw in a comment you left that the rest of the calcium mixture can be stored for months… I can’t imagine needing it again by then though). To help prevent others doing what I did, maybe you should adjust the amount mixed to match the rest of the ingredient amounts?? Other than that – thanks for the recipe, it gave me the confidence to try out making jam. I had done so before but I never remember what recipe I use so it sometimes prevents me from looking all over for the recipe again. I’m so excited to learn about a less-sugar option! PS. Boise Co-op also sells the pectin, I paid somewhere around $5.50 for the box. Hey Stephanie – you can freeze the calcium/water mixture (in ice cubes or in a freezer-safe container) and use it next year. Sorry for the confusion! I’ll add more clarification to the recipe. Will this recipe work for a combination of fruit or just stawberry? I really love strawberry, but I also like to make strawberry blueberry. And I’ve been wanting to make raspberry stawberry or peach raspberry or mango strawberry. Freezee jam is my favorite kind. Mmmm….I’m getting all excited about homemade jam and bread. Yes, this should work with a combination of fruits (although I usually stick with strawberry). I made two regular batches tonight and then one double batch. Mainly because I couldn’t get to it until after the kids were in bed and I wanted to make sure I did it right (I can’t think clearly with my blessed distractions awake.) The first batch was heaven. The second batch was divine. The third double batch was, well…. I don’t know… still fantastic but I messed up somewhere along the way. I had a lot of calcium powder left (so if you’re tripling the batch, I wouldn’t recommend just dumping the whole thing of mixed calcium in when it’s time… I’d measure it out), but was 1/2 a tablespoon short of pectin. Woops. Then I reread the recipe. Oh yeah, you said one box would triple the batch… not quadruple. I chalk it up to it being midnight. If left to my own devices, I’m either distracted by my lovelies or too tired to think straight. Oh well. Even if it doesn’t set up great, it will be pretty yummy as an ice cream sauce or pancake sauce. Mel, would it be possible for the cooking illiterate like myself if you could write out a big batch recipe (as in a recipe that uses the whole box)? Somehow I just can’t quite make it there on my own. Bless you and Pomona and all your jammy goodness. I just ordered the pectin and I’m so excited to make tons of batches of jam! Question: I love the idea of using a food processor but I don’t have a large one! I do have a Vitamix blender though. Do you think it would work to make the jam in the blender and mix the pectin in my small food processor?? I noticed you said you would post a recipe for peach jam in the fall when peaches are on. I live in Oklahoma and my peaches will be ready in 3-4 days. I would love to have apeach jam recipe NOW!!! Is that possible for you to do sooner rather than later. It’s not anything too top secret – it’s just the one from the box of Pomona’s Pectin – I use half honey, half sugar. How does the jam from this recipe hold up on peanut butter and jelly sandwiches you pack your kids for lunch? Seems to work great – they never complain. It’s on the softer side, but that doesn’t seem to bother them. OK, I’m sure this is a dumb question, but for the calcium powder mixture, could I just mix 1/4 tsp of the calcium powder with 1/4 cup of water, so I don’t have leftover mixture? Absolutely! I usually mix it all up because I’m doing large batches, but you could definitely just use what you think you’ll need. Is there a way to let all the bubbles release from the jam before you stir in the pectin? The one thing I don’t like about freezer jam is that there are little bubbles throughout it unlike the heated version. Any way to let all the bubbles settle or not blend the fruit? That’s a good question, but to be honest, I’ve never noticed the bubbles in this variation of freezer jam. I’m going to open a new container in the morning; I’ll double check – maybe I’ve just never noticed before. Thanks for posting this Mel! Because of health reasons, I had to start eating low carb, (insert frowny face) which means no sugar laden freezer jam (among tons of other things!). I checked their website, and the no carb sweetener that I’ve been using will work with this pectin. I can’t tell you how excited I am 🙂 Thank you thank you!! Have used Pomona’s U P for several years now. I don’t like jams or jellies so sweet you can’t even taste the fruit. There are recipes right in the box, strawberry is our favorite with their Sweet Blackberry jam a close second. I know, I know, most people don’t like the seeds but I just say that’s what makes this jam healthy. One of my neighbors says my strawberry jam is his favorite birthday gift although he confessed to me last year that he uses it more as an ice cream topping because it tastes so much like fresh strawberries. For some reason I am obsessed with those white plastic lids too! But I recently made a life-changing discovery… mayo/miracle whip lids fit on mason jars! So I have been saving all my lids and now have a nice little stash for all my strawberry jam needs. 🙂 Thank you for all your fabulous recipes, can’t wait to try this one! I just made this today but when I put the pectin and the boiling water in the blender it had a hard time mixing. It was barely above the blades. Then it got super clumpy and it was hard to get out of the blender. When I put it in with the jam there were still big clumps and it didn’t thicken. I tried using a whisk but it wouldn’t blend together. I looked up on Pamona’s website at the faq and the only thing I could figure was to cook it to dissolve the lumps. What did I do wrong? Have you ever had your pectin clump up? Any ideas how to do it differently so I don’t have that problem? I love that it has less sugar and want to make more. Hey Angie – ah darn. Yes, the boiling water and pectin has to dissolve/mix completely so there are no lumps otherwise the jam won’t thicken. Do you have an immersion blender or other smaller blender jar that you could use so that the liquid/pectin fills it up more (is above the blade) and mixes better? The only other thing I’d suggest is to double the recipe, if you have enough strawberries, so the boiling water/pectin is a larger quantity and mixes better. Hi Mel, have you ever tried Ball Instant Pectin? Wondering if you have compared that with Pomona, ingredients and quality. The Ball Instant Pectin makes really yummy freezer strawberry jam too, and the ratio is 5 cups fruit to 2 cups sugar. I’ve never tried Pomona but it sounds fabulous! I haven’t tried that pectin, Marne – that’s great it can be used with less sugar, too. I just did a quick google search and it looks like the Ball Instant Pectin has these ingredients: Dextrose, Fruit Pectin, Citric Acid (Assists Gel), Sodium Citrate (Controls Acidity), Potassium Sorbate (Preservative) and Pomona’s has these ingredients: citrus pectin and calcium powder. So excited to try this pectin! I always cringe at how much sugar usually goes into freezer jam! Thanks Mel! If I’m understanding correctly, you can double and maybe even triple this recipe with only 1 box of pomona’s correct? Yes – at least a double batch and most likely a triple batch (there’s right around 3 tablespoons of pectin in each box of Pomona’s, but it varies just slightly from box to box). We just made a triple batch, and there was the perfect amount of pectin in the box (3 Tb). Hi Mel, I have been loving your recipes for years and am slowly trying to convince my husband that homemade is definitely better! I would love to see a recipe for canning apple butter along with homemade applesauce – my husband loves both!! what did you find about mixing rhubarb with berries (blackberries for me)? i finally have a great harvest of rhubarb now that weve moved them to a sure place to receive water! This recipe looks great, definitely going to be giving it a try! We can wild raspberry jam, but we usually don’t find enough to last us the year so this will be a great addition! I’m excited to see your future posts on canning! I would love to see a spaghetti sauce and pizza sauce, I’ve never been brave enough to try canning anything with tomatoes. There is nothing quite like the satisfaction you get from canning and baking homemade bread (which I can do thanks to you!)! Mel, thanks for this post! I was just thinking about my annual strawberry freezer jam fest when we get local strawberries here in MI. Mine is associated with “Strawberry Pie Day” at my house – the whole family talks about that one-day-only event. I usually use a low-sugar pectin from the grocery store, but I will try this instead. I too am in love with the flavor of the fruit, not so much the sugar. I am excited to try this no cook method! I also have two stand up freezers so I know the pain when a kiddo leave the door cracked. Sad face. What a fun day to look forward to! 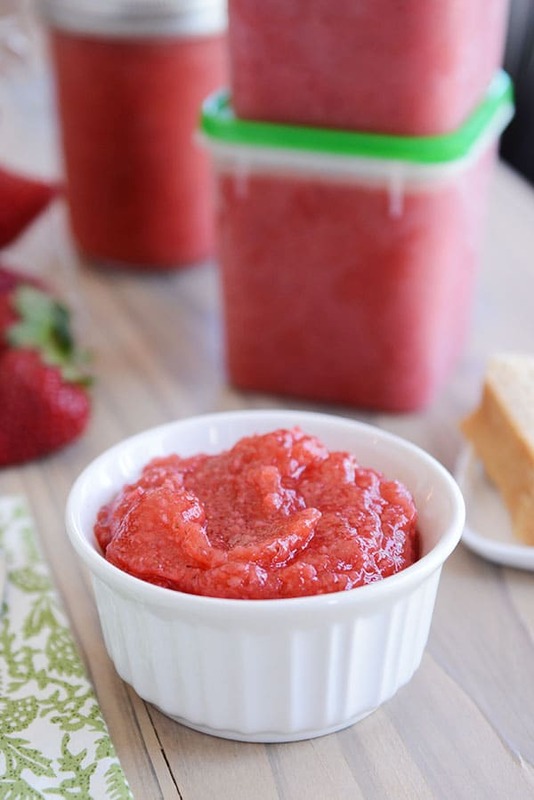 I’ve never tried freezer jam, but will definitely try this when it’s strawberry season! I should probably order the pectin now.So excited for your coming canning posts!!! I love canning!! I followed the link on your site to check out the price and I hope you will clarify this for me. It says it is a 6 pack of one ounce containers. Are you saying that a six pack will make 6-9 pints of jam? By 6 pack do they mean there are 3 packs of pectin and 3 packs of calcium? Thanks for your help! Hi Sandra – the 6-pack is six boxes of Pomona’s Pectin (each box contains a packet of pectin and a packet of calcium powder). Since each box of pectin will make about 6-8 pints of jam, the 6-pack listed on Amazon will make about 36-48 pints of jam. Does that help? Yes it does help! That makes it much less expensive than I thought. Thanks! Can you tell me how many boxes of pectin you used for 32 lbs? I am buying 30 lbs. Thanks. I used about 4 boxes of Pomona’s for my 32 pounds. I have used only Pomona’s Pectin for the last 4 years. It is, hands down, the best Pectin on the market. It allows you to sweeten to taste. I have never had a batch fail and I do 8-9 dozen a year. Love it! I love this post, Mel! I have only ever made cooked strawberry jam. This is definitely something I want to try. The strawberries coming from California now are so amazingly juicy and sweet. I am going to make this my weekend project!!! I’ve been using this pectin for years and love it too. It’s also so much cheaper than those $3/box sure jells. With the amount of freezer jam we go through you’d think my family drinks it. And now they (me too) refuse to eat store bought jam, so I’m going to be making it forever. So my last(also only) experience with Pamona’s wasn’t fully to my liking. Maybe you or someone else can help explain what happened and maybe I’ll get the courage to try it again. I picked Pamona’s for the same reason as you and was thrilled to try it. I made regular cooked and canned strawberry jam though and at first it was fantastic. But I noticed that over time, the beautiful strawberry jewel color faded to an off-putting, well, pinkish brownish color. I can tell you that they were sealed just fine, and its still edible, but the color is not good. Could this be to the lack of sugar? Would it be better to just use Pamona’s with freezer jam? Or just add some more sugar? Much appreciated! Hey Christy! Did you use the lemon juice that is often optional in the Pomona’s cooked recipes? I made some strawberry jam last year that was cooked and sealed via steam bath (and I used Pomona’s Pectin) and it, just like yours, is not the most appealing color. It still tastes delicious, but it is definitely more brownish than pretty red. But in my case, I didn’t use the lemon juice, and I think that is why? I’ve made lots and lots of cooked jam with Pomona’s over the years, and usually the color stays vibrant and pretty, so I’m wondering if the lemon juice is critical to color…I may start adding a bit more if I make cooked strawberry jam again. You know, I honestly can’t remember if I used the lemon juice last time (the whole being a new mom and sleeping since then might be a factor haha!). But I will definitely try it next time. Thanks Mel! I’ve had that happen too after using Surejell, so it’s probably has more to do with not having enough lemon juice then the Pamonas Pectin. I just went and picked strawberries today, just to try making this jam. I can’t wait to test it out! Mmm. 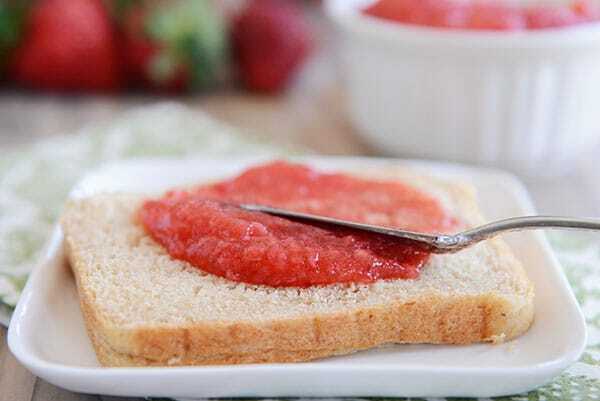 Strawberries are pretty much my favorite thing on the planet, so this jam looks downright delectable. I’m super interested to try out your version with the Pomona’s. Now, for that standing freezer so I have room for it all…. It every summer and try to make enough to last through the year. Somehow as the kids have gotten older this is much harder to do and they are very sad for months until it’s time to make it again when we run out! We’ve been seriously deprived since last summer new baby happened and so jam making did not happen! I’ve been using the Better Homes and Garden recipe for strawberry freezer jam all these years and it calls for 4 cups sugar! I am SO happy to have this recipe and I can’t wait to give it a try! I will feel so much better about myself when I just want to make homemade bread and slather it with jam! Thank you!! Would you make this with raspberries? Or just stick to strawberries? Yes, you can definitely make it with raspberries (super tasty) – just adjust the amount of sugar as needed (the lemon juice, pectin and calcium stay the same for the amount of berries listed in the recipe). My kids aren’t big fans of the seeds in raspberry jam so I haven’t made a raspberry version for a while, but it works great! Mel! Thank for this! My plan for the summer is to learn how to can so that I have something to give out for all the Christmas presents this coming year. My December is already swamped and I would love to have some options ready to go for Teacher Gifts, dinner party hostess gifts, etc. Any easy canning recipes would be much appreciated. Have a great Mother’s Day weekend! You and I are thinking alike! The last few years, I’ve given out a canned good for Christmas gifts and it makes it SO much less stressful in December! 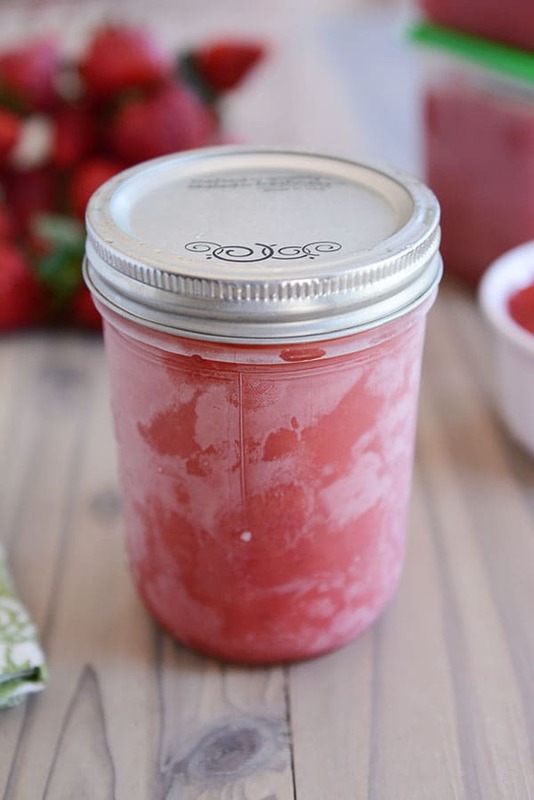 Just last week I made a batch of low-sugar strawberry freezer jam (sure jell), but the idea of even less sugar with Pomona pectin has me sold! Next batch will be coming shortly with your recipe. Thanks again!! Haha, well, I hope between the two of us, we can convince her! Mel, when I do berry jam I run my berries through a hand crank sieve to get out all the seeds (darn those picky kids!). I end up with more of a berry juice than a pulp. Will that work with pomona’s – I mean will it still set? It usually does with other brands, although they warn against it. That’s a great question, Jill. You might check Pomona’s website to be sure. They have a FAQ section (www.pomonapectin.com). My gut feeling is yes, but I don’t know for sure. Thanks Mel for this post. I am tired of how much sugar is required with other pectins. I love canning and preserving food. I grew up storing veggies in a root cellar. I make all my own pickles and sweet zuchini relish. In addition to freezer jams I love to pick my own blackberries, remove the seeds and cook yummy jelly. It is actually quite easy to make. Looking forward to trying this pectin!! Thanks again for your great recipes!! Oh we LOVE sweet zucchini relish made from my Grandmother’s recipe! Sweet zucchini relish? Super intrigued by this! Have you ever made freezer jam with UltraGel? The sugar ratios are about the same as this pectin, which is awesome! I wonder how taste compares because it’s even a little simpler- just mix the sugar, pureed strawberries and ultragel and let it sit for 15 minutes to come together, then freeze. I use this, too! I like not having to cook anything, just sprinkle and stir. The ratio is 4 c crushed fruit to 2 c sugar and 1/2 c ultra-gel. If the strawberries are super sweet already, though, I’ve gone down to 1.5 c. sugar. Ultra-gel is just modified corn starch. So I did a few batches of jam last night with Pomona and a few with ultra gel. Then I did a blind taste test with my husband who preferred the slightly more tart Pomona. I however leaned toward the ultra gel- it is so dang easy to make! We love strawberry freezer jam! We’ve been really into canning the last couple summers and I can’t wait to do more this year! Do you have a recipe for canning grape juice that you love? Hey Paige – I usually just use my nutri-steamer to juice the grapes and then water or steam bath can them – so definitely nothing fancy! I cannot wait to try this. I’ve never made freezer jam but lots of jam in only a couple hours definitely appeals to me. And the last batch of jam I made is running dangerously low because my children are going through it at a ridiculous rate. I hope I can get that pectin here – I hate how much sugar goes into some jam recipes – more sugar then fruit just doesn’t seem right! So glad you posted this! I just ordered the pectin you recommended and am eager to compare the jam’s taste to my recipe! I bet Amazon is going to sell out of this product!! Thanks for being a reliable source for new and delicious recipes for my kitchen! Thanks, Melinda – let me know what you think! OH MY GOODNESS! The jam is rich in color and taste! This is a keeper! Have you made other types of jam….peach? raspberry or blackberry?? I haven’t made any other kind of freezer jam with this recipe (I usually use a cooked peach jam recipe). What do you typically pay for one box of the pectin? Right around $4 to $4.50, depending on where I get it. If, say, you can’t find Pamonas, Ball’s instant Pectin works splendid! Ok, it does have a preservative in it, but it uses way less sugar than anything else, and makes delicious freezer jam. The fruit to sugar ratio is about the same as Pamonas. Thanks, Ellen! I love the preservative-free nature of Pomona’s but it’s nice to have a backup! I love using Pomona’s! I follow the recipes in the box for a variety of jams (cooked and frozen) and they always turn out great. I really appreciate using less sugar, like you mentioned. My husband and I can together (with some help from our 4.5 year old) but took a break last year after the infamous 7 gallon pickle incident of 2015. It’s game on for this year and I’m adding this to the canning list. I second a request for a peach jam recipe! Haha, I have no idea what the infamous 7 gallon pickle incident is, but it sounds hilarious, and I think I need to know more. Maybe it’s just me, but it took me a while to figure out that the calcium powder is included in the pectin box. Just in case anyone is searching for where to find calcium powder ☺️ So excited to make this! Thanks Mel! Yes! I thought I was a loser. Thanks! Sorry for the confusion, Sam! The calcium powder and pectin is included in the box of Pomona’s – I explain that in the post but not very well in the video (apparently). Oh, sorry about the confusion on that! Have you ever canned chicken? Homemade canned chicken is delicious and so easy to toss in a quick batch of enchiladas, or tacos, or your Parmesan Chicken Pillows! And of course, being home canned, it is not the overly salty, overly processed can from the store. Yes! I love canning chicken. A friend taught me a couple years ago and it’s a little time-consuming (just waiting on the pressure canner) but I agree…delicious! I always use low sugar pectin for my jam but it still seems like a lot of sugar. I’m excited to try this! Where did you buy your 32 lbs of strawberries? I can’t wait to try this! Can you add a mixture of different berries or just different fruit? I’m really excited to try this Mel! My husband loves homemade jam and I have yet to make it, so thanks for breaking it down for the newbies! This looks perfectly do-able! Do you have canning recipes? I’m gonna check:) I have a hot water bath and cans, but again have been a little scared. I am hoping to can at least peaches this year! Thanks for your hard work…. not sure how you do it! Can you use this same recipe to make freezer raspberry jam? Yep! You may need to adjust sugar amounts but the pectin and calcium water and lemon juice is the same. Thanks, Mel! Like Ann, I bought some Pomona’s and have yet to use it. The video is great! Also, I never paid attention to freezer jam recipes. Well, I am now and will make this as soon as I round up some strawberries, but not 32 pounds! I hope to can salsa per your recipe … also the Jalapeno Jelly but will wait for the Pomona’s version. As far as requests, peach jam would be on my list as we get some local peaches. Oh, I have the best recipe for peach jam! I’ll definitely add that to the docket for the fall when we get peaches on around here. I’m so glad you posted this! I bought Pamona’s last time you talked about it but never used it. I think I was intimidated 🙂 Can’t wait to try it now. Oh, I love this! I used to love eating strawberry freezer jam right from the freezer. I’ve made it a time or two as an adult, but always shudder at that sugar to fruit ratio. This, I can definitely handle. Now, if I could only find a less expensive strawberry source!